Definition (NCI) An electrocardiographic finding of delayed or blocked cardiac electrical impulse conduction from the atria to the ventricles at the level of the atrioventricular node. Definition (MSH) Impaired impulse conduction from HEART ATRIA to HEART VENTRICLES. 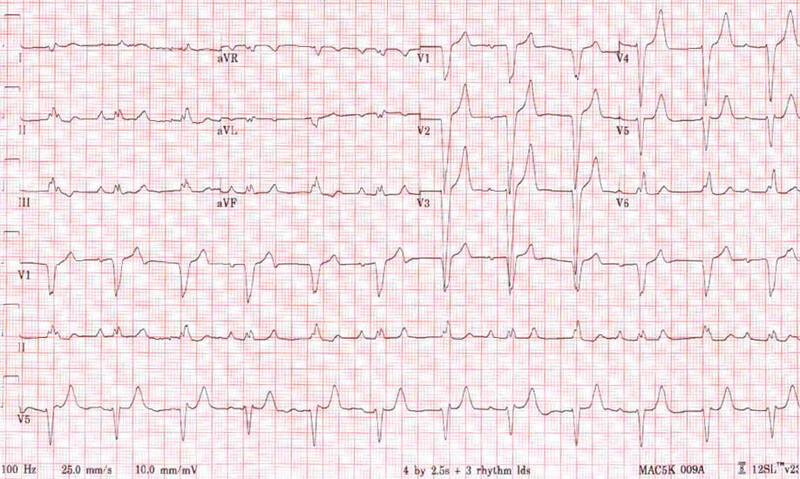 AV block can mean delayed or completely blocked impulse conduction. Definition (MSHCZE) Porucha vedení srdečního impulsu, která se může objevit kdekoli na jeho dráze, např. přímo v sinoatriálním uzlu (Keith-Flackův uzel, NODUS SINOATRIALIS) a pravé síni (SA sinoatriální blokáda) nebo mezi síní a komorou (AV atrioventrikulární blokáda). Srdeční blokády mohou být klasifikovány podle délky trvání, podle frekvence nebo úplnosti přerušení vedení impulsu. Reverzibilita závisí na stupni strukturální nebo funkční poruchy. Definition (CSP) impairment of conduction in heart excitation; often applied specifically to atrioventricular heart block. Definition (MSH) Impaired conduction of cardiac impulse that can occur anywhere along the conduction pathway, such as between the SINOATRIAL NODE and the right atrium (SA block) or between atria and ventricles (AV block). Heart blocks can be classified by the duration, frequency, or completeness of conduction block. Reversibility depends on the degree of structural or functional defects. Hungarian Szívblock, Szívblock (k.m.n. ), Szívblock k.m.n. Definition (MSH) Disturbance in the atrial activation that is caused by transient failure of impulse conduction from the SINOATRIAL NODE to the HEART ATRIA. It is characterized by a delayed in heartbeat and pauses between P waves in an ELECTROCARDIOGRAM. Definition (NCI_CTCAE) A disorder characterized by a dysrhythmia with a delay in the time required for the conduction of an electrical impulse through the atrioventricular (AV) node beyond 0.2 seconds; prolongation of the PR interval greater than 200 milliseconds. Definition (NCI) A disorder characterized by an electrocardiographic finding of prolonged PR interval for a specific population. For adults one common threshold is a PR interval greater than 0.20 seconds. Definition (NCI_CTCAE) A disorder characterized by a dysrhythmia with complete failure of atrial electrical impulse conduction through the AV node to the ventricles. Definition (NCI_CTCAE) A disorder characterized by a dysrhythmia with relatively constant PR interval prior to the block of an atrial impulse. This is the result of intermittent failure of atrial electrical impulse conduction through the atrioventricular (AV) node to the ventricles. Definition (NCI) Intermittent failure of atrial electrical impulse conduction to the ventricles. Definition (NCI_CTCAE) A disorder characterized by a dysrhythmia with a progressively lengthening PR interval prior to the blocking of an atrial impulse. This is the result of intermittent failure of atrial electrical impulse conduction through the atrioventricular (AV) node to the ventricles. This page was written by Scott Moses, MD, last revised on 12/24/2016 and last published on 4/6/2019.